The Red Tailed Catfish if part of the catfish family. Their scientific name is Phractocephalus Hemiolliopterus. In the wild they live in South America. 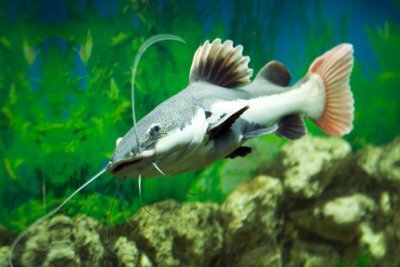 Red Tailed Catfish grow up around 90 cm and in some cases even 120 cm. It is probably one of the largest freshwater fish available to aquarium hobbyists. Due to its large size many people have argued that fish shops should be stopped from selling them as an aquarium fish. People often buy these fish when they are about 1 to 2 inches long and they don’t realise how big or fast they will grow. I have seen this fish twice during all my years of fish keeping. The first was while visiting Water Zoo, which is a specialist aquatic shop in Peterborough, England. The fish was in a large tank at the front of the shop, the glass tank was probably the size of some people living rooms. The fish itself was around 1 metre long, someone had named it Frank. Frank was undoubtedly one of the most awe inspiring fish I had ever seen. The sight acted as a warning to me to always research the fish you want to buy before you buy them, or you could end up with a fish like that. The second time I saw one of these fish was in my local aquatic shop a few months ago. I was looking around my local aquatic shop with my mother. She saw a fish she liked and said how cute it was. I went over to look and saw it was a Red Tailed Catfish. Even though I knew how big it would grow, I couldn’t help being drawn to its cute little face. On the debate of if this fish should be banned, I say it should not be banned. Aquatic and pet shop owners have a duty to offer good advice to their customers on which fish to buy. Fish keepers have duty to research the fish they are going to buy and make sure they are ready to cope with those fish. Many fish are bought in error especially Oscars, Plecos, Siamese Fighting Fish and Tiger Barbs. You shouldn’t ban all these fish just because some people are silly enough to buy fish they are not ready for, that would penalise those who are fortunate to offer these amazing fish a good home. If you buy a Red Tailed Catfish you are going to need a massive aquarium or alternatively an indoor pond. The tank will need to be at least 2000 litres in size. That size aquarium will probably need to be custom made. They are very sensitive to dirty water and they produce a lot of waste, so you would need some heavy duty filters. I have heard of people using pond filters as they tend to have a higher capacity then aquarium filters. You will also need to do regular water changes to keep the water as clean as possible. This fish likes to have somewhere to hide away, although this can be difficult to provide due to their size. You will need to be careful not to have anything in the tank that is small enough to fit in their mouths, they will try and eat anything including rocks, wood and aquarium equipment. Red tails have a massive appetite and they do prefer live food, if they acquire a taste for it they may refuse other food later in life. They will eat fish, beef heart, crustaceans, and fruit. 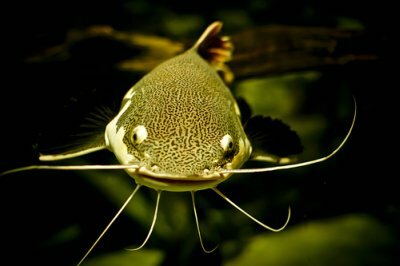 You can also feed them catfish pellets or tablets, but you’ll probably need quite a lot to satisfy them.